When you are a business wanting to get noticed by your customers, there is little doubt that the type of sign that makes the biggest impact is a neon sign, however not all companies are equal when looking for a neon sign. So what do you look for when considering a neon sign? 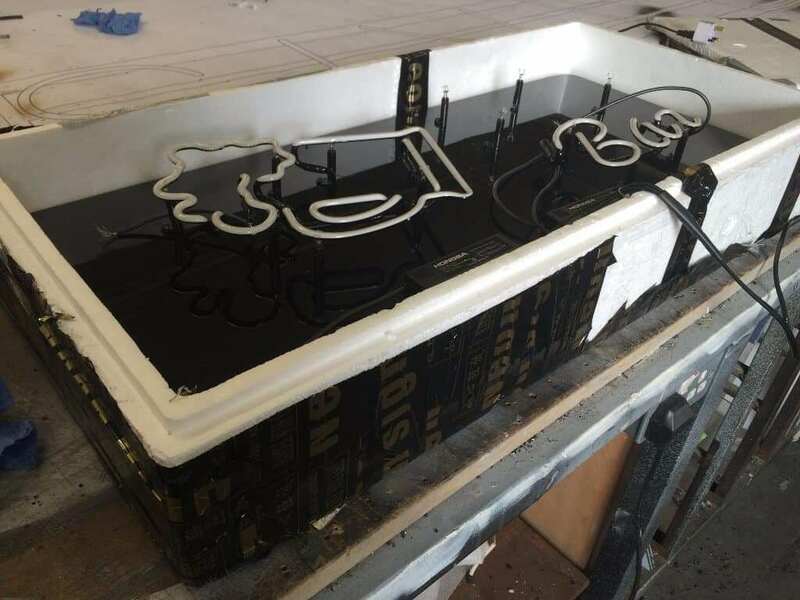 Experience in the design, manufacture and installation of a neon sign is very important, along with a good understanding of the regulations that need to be adhered to in order to make a neon sign installation safe. Very few companies manufacture neon across the UK since the introduction of LED’s, which in some cases is a good thing, many of the problems in the past with neon were created by a poor final installation along with a poor approach to its manufacture. When manufactured and installed correctly, neon signs will give you years of pleasure with no problems. 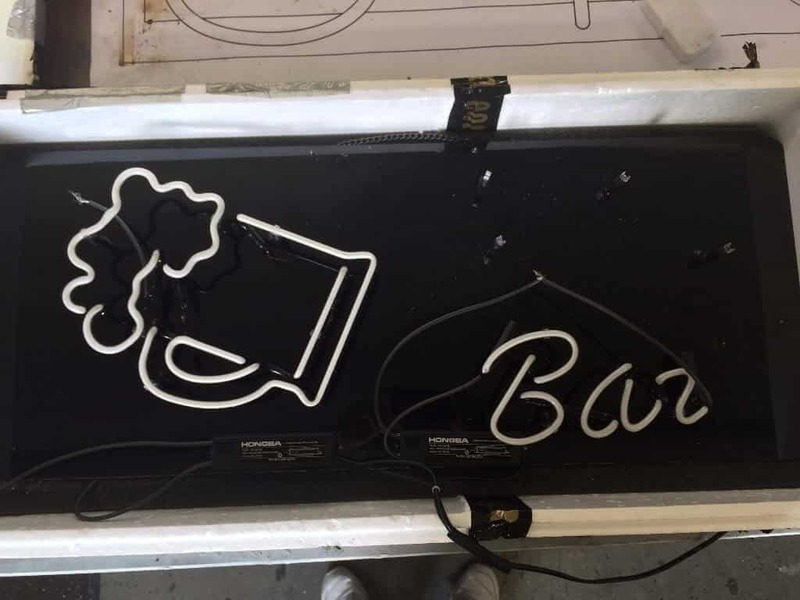 At A1deSIGNS we have been manufacturing neon signs for over 35 years, and with a combined experience in excess of 200 years, we know the best manufacturing techniques to provide you with a neon sign that meets your every expectation. When your neon sign is being priced up, bear in mind the materials being used in conjunction with the neon sign. Make sure you understand the way the sign is to be mounted, where and how the neon sign is going to be used, as this all makes a difference to the type of equipment that should be used when manufacturing and installing your neon sign. Some companies will provide you with the cheapest option just to get the job, as opposed to providing a solution that meets your requirements to ensure the longevity of your neon sign and you end up happy with what you receive. 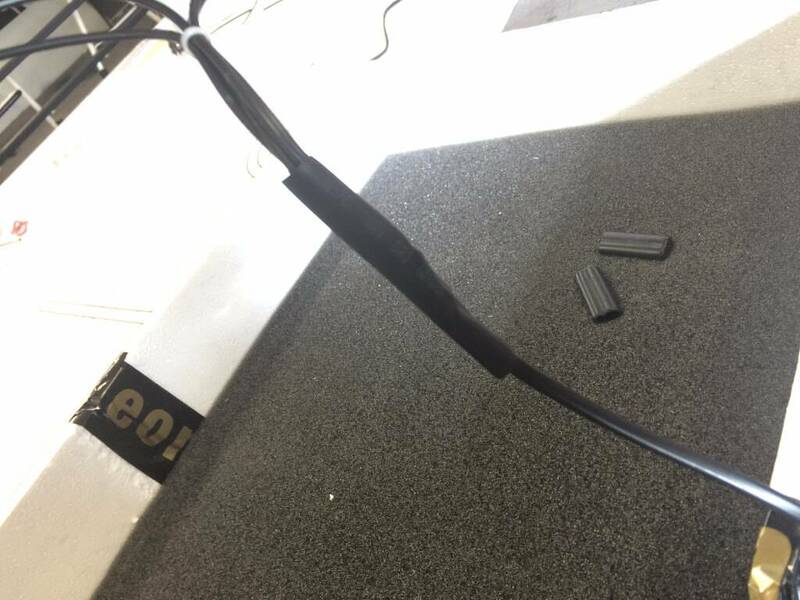 Also avoid any product that involves joins in cables between letters as this does not meet regulations and if not securely connected can cause a fire. When it comes to a neon sign that doesn’t last, there are few places that manage it better than our Asian counterparts, their products tend to be cheaper, but then tend to only last in some cases as little as 3 months, at best they can last a up to a couple of years. But not only that, their transformers don’t always meet up to EU standards some even have stamps for standards they have not achieved. The workmanship is often poor, and customers don’t end up with what they expect, how do we know this? You may ask. 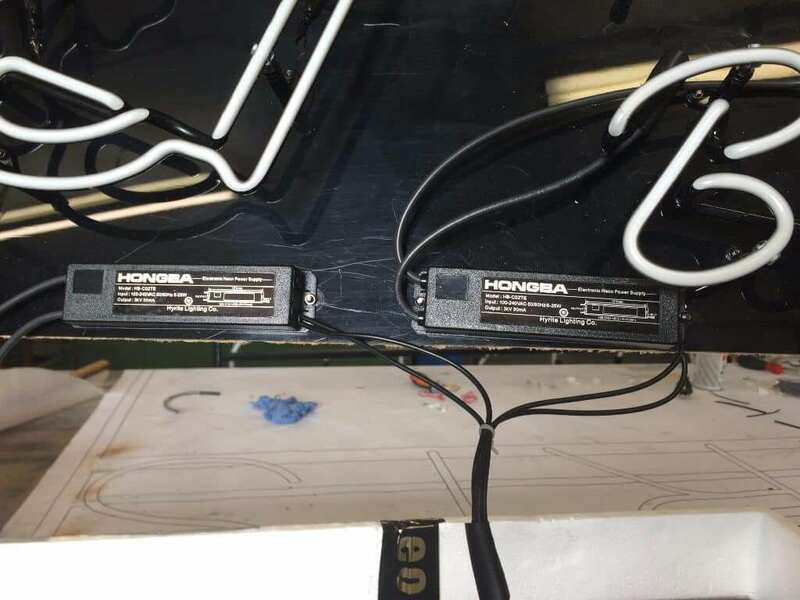 We often get neon signs that were manufactured in china brought into us for repair, a recent sign need repair after delivery, but not only that the transformers were positioned without care and attention and the beer cup was put the wrong way up. 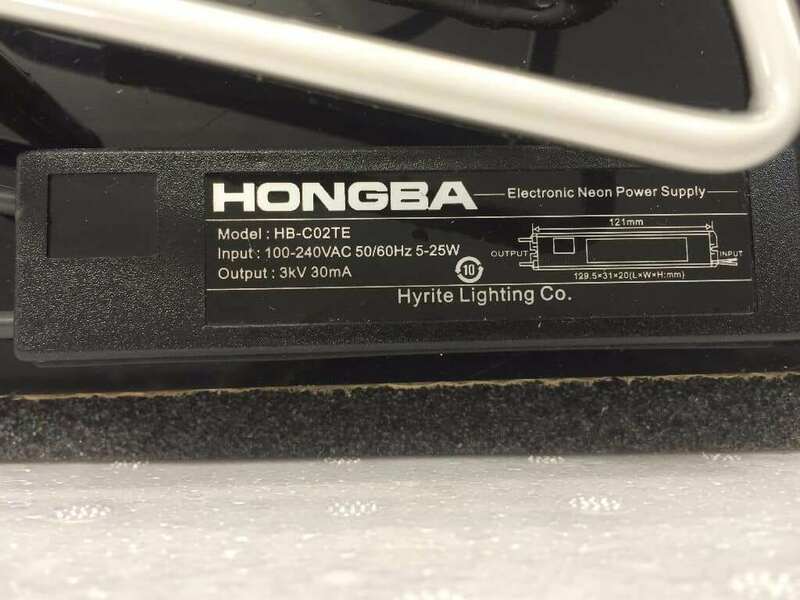 Due to the neon sign being imported, often customers also end up with a surprise import duty bill, along with a warranty that’s not worth the paper it’s written on. Note The sign is poorly packaged to send internationally, the beer mug is at the wrong angle, transformers are poorly installed (not Level/straight or inline with each other), Transformers don’t have a CE Mark, Connection of power cable to transformers is poorly made. Acrylic back panel is badly scratched.